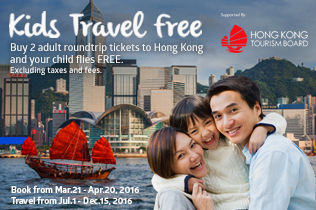 Philippine Airlines Promo 2016: Enjoy a memorable Hong Kong family getaway with a free flight from Philippine Airlines. Experience the full perks of traveling with Philippine Airlines. Get free airfare (excluding taxes and fees) for your child when you book 2 adult roundtrip Hong Kong tickets from now until April 20, 2016. And it doesn’t stop there! With Hong Kong Family Fun program, your family can enjoy special discounts and deals in participating theme parks, attractions and hotels when you book through select travel agencies. Fly with the airline that celebrates the Heart of the Filipino. 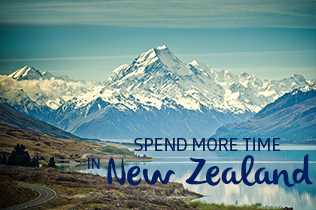 All-in Economy roundtrip fares start as low as USD234 per adult. Book your flights now at any PAL Ticket Office or travel agency. Offer not available online. All-in Economy roundtrip fare for each adult. Valid for sale in the Philippines only. For Hongkong, fare is exclusive of Hongkong Security tax of USD5.80. Fares are subject to change due to currency conversion rate. Fare is non-refundable for totally unused and partially used tickets. No-Show fee is USD75.00. Change fee is USD100.00 per transaction. Philippine Travel Tax is applicable to Philippine passport holders, foreigners holding a Philippine resident visa, and foreign tourists or expatriates who have stayed in the Philippines for more than one (1) year. Ticket is non-transferable. Fare is refundable when application for visa is denied. Passenger must show proof of application and denial at any PAL ticket office. Flight reservation must be cancelled upon passenger’s receipt of visa denial or 7 days prior to departure, whichever is earlier. For visa denial within 7 days prior to departure date, PAL will collect No-Show fee unless booking is cancelled 24 hours before departure date. Budget Economy Fare comes with 50% Mabuhay Miles accrual and Regular Economy comes with 100% Mabuhay Miles accrual. Quoted fare is rounded off to the nearest whole number. Other travel conditions apply. Fare is inclusive of 7-kg handcarried baggage. Free check-in baggage allowance for Economy is 20 kgs. There may be additional fees for your checked baggage, in excess of your free baggage allowance. 1. The child must be aged from 0 month to below 12 years old. 2. All three (3) passengers must be under one (1) booking.They may be rebooked all at the same time. They must travel together bothways. 3. A copy of the passport of each passenger must be presented to the PAL ticket office or travel agent.